Nestled up on a hill in Camaruche, this property has lots of charm with its lush vegetation and beautiful, tropical flowers. The house itself has accents of all shades of blue throughout from bright vibrant blue window shutters to blue sofas with turquoise accent pillows. You can’t help but feel relaxed and know you have switched to Caribbean time when you walk around Blue Rock villa. The outside terrace has a large area with comfy seating to catch up on your reading or you can take a nap in the hammock. If you’re wanting to sunbathe, just take a dip in the pool and lounge in a relaxing chaise and soak up the rays. Both bedrooms are quite large so this would be great for two couples to share and yet still feel like they are able to have their own space. St. Barts is quite a small island so you can have the best of both worlds by having the privacy of this beautiful property but within driving distance to many other amenities. 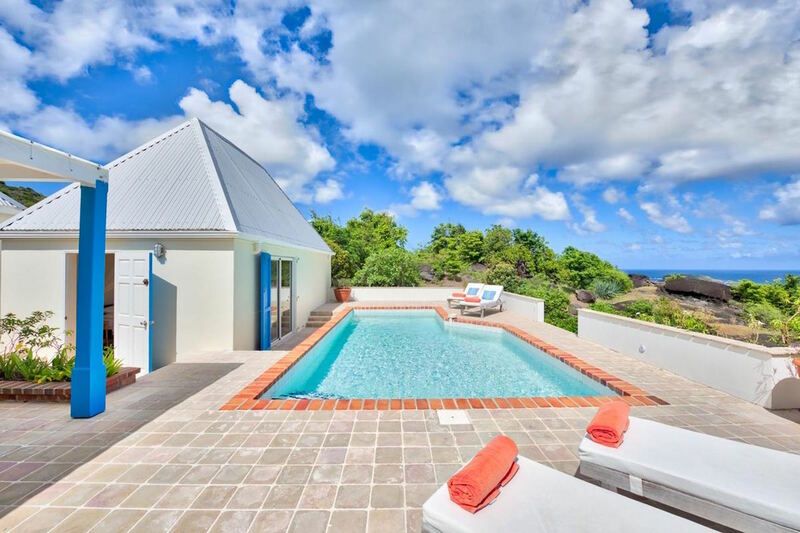 Located in Camaruche, Blue Rock Villa is very comfortable with a view over the hillside and the Atlantic in the distance. This villa has harmonious colors combined with antique pieces, that certainly add to its unique charm. With extensive gardens and interesting volcanic-rock formations, the property is extremely private with many areas for sitting in the shade or in the sun. The bedrooms are completely independent from each other making this an ideal place for two couples or a family with teenagers. A/C throughout villa	: In all bedrooms and living areas. Very close to Lorient beach. Wonderful villa - we loved the view, hospitality of the island, and ability to truly relax here. We especially liked the hammock, views from the living room, and the spacious living room. The housekeeper did an excellent job. Shawna was professional and helpful. This villa was a good value for the rent cost. The maid was very good. We stayed 3 weeks, so I did miss having a washing machine after a while. The pillows need to be replaced, and the area was too windy to use the pool. But perfect location, clean, and well priced for St Barts. Shawna was excellent as usual.